Loach's return to documentary has attracted wide coverage – with cinema and DVD releases and Film4 television screening on 25th June – reflecting media sector acknowledgement of thirst among audiences for correctives to the neoliberal triumphalism now wearing exceedingly thin. So, riding waves of Olympics and other jingoisms, the veteran director panders to resurgent nationalism with an old-leftie twist, celebrating Labour's landslide 1945 victory after World War Two and its social-democratic programme of universal welfare and state control of the economy. The structure and aesthetics of the film are also unashamedly backward-looking, based on extensive black-and-white archive footage and contemporary interviews – with survivors of pre-war misery and witnesses to postwar reconstruction through to talking-head 'experts' – adopting the same monochrome palette. The shift to colour in closing clips of Stop the War, Occupy, UK Uncut and Save the NHS banners and demonstrations finally reinforces the message that present-day ragtag resistance requires unification through an updated 'spirit of '45'. The first half-hour gives timely reminders of working-class poverty in 1920s and 30s Britain – unemployment, appalling working conditions, disgusting accommodation and unaffordable medical care – the rich maintaining power through their imperial 'free market' after the slaughter of the 1914-18 war and with the labour movement's fitful growth thereafter. Nevertheless, the film's second act recounts experiences of collective strength during WW2 in military and civilian spheres feeding beliefs that the masses could also 'win the peace' and never return to the prior status quo. 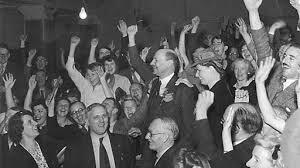 Thus a bemused Winston Churchill is heckled at 1945 election hustings, Clement Attlee proclaims 'socialism', and subsequent nationalisations of housing, health provision and industry receive rapturous welcomes. We then jump-cut to Thatcher's 1980s and ongoing privatisations, attacks on organised labour and the decimation of welfare heralding a vicious circle to the bad old days of our starting point – unless, allegedly, the corpse of socialism can be resuscitated. As an extremely blunt instrument for rousing the rabble from the slumber of 'there is no alternative', The Spirit of '45 may serve some valid purpose for those with little knowledge of history or experience of activism. But although its broad-brush approach inevitably entails oversimplification, some of the glaring omissions  are so clumsily or egregiously concealed as to suggest bad faith as well as bad politics – risking contributing to prevailing apathy and cynicism rather than renewed grassroots opposition. Thus the most serious self-inflicted failings and defeats of, and fatal compromises and betrayals perpetrated by, the Labour Party, trade unions and state socialism in general – not to mention their regular exasperated repudiation by disillusioned working-class people – are conveniently ignored or blithely glossed over . 1. see, for notable examples: 'Left Unity ... No Thanks', reposted at http://ianbone.wordpress.com/2013/04/30/; and Anna Chen, 'Ethnically Cleansing History', at http://madammiaow.blogspot.co.uk/2013/06. 2. including by prominent specimens of exactly the types of elitist, self-important bureaucrats and manipulators substantially responsible. And however well-meaning we may charitably deem (some of) them to be, and whatever useful activities they might on occasion have been party to, such political racketeers and their supporters also continue to conscientiously stitch up and wreck coalitions of resistance, people's assemblies, and other potentially significant public manifestations – all in the interests of their wretched self-serving vanguardist delusions, and just as they do when manoeuvering into positions of influence anywhere. Review first published in Freedom, Vol. 74, No. 6, July 2013. Having watched Spirit of '45 recently, I have to take issue with this review on a few points. "The structure and aesthetics of the film are also unashamedly backward-looking, based on extensive black-and-white archive footage and contemporary interviews"
Well, the film is mostly about the the pre war and immeadiete post war era. To criticise Ken Loach for using extensive black and white footage when the subject much of the film is from that period is bizaare as is the charge of being backward-looking. "with survivors of pre-war misery and witnesses to postwar reconstruction through to talking-head 'experts' – adopting the same monochrome palette"
What an incredibly dismissive attitude to those people interviewed who lived through poverty most of us can only imagine or will only read about in books. Should they have jazzed up their stories of poverty? Should they have interupted their recollections of parents and siblings dieing through lack of medical care to launch into a theoretical diatribe that would have pleased the reviewer? Jennings then criticises "glaring omissions" such as the betrayl of working people by the Labour Party and the failure of state socialism. While I agree that more should have been said, these failings were touched upon eg. the bosses of the old coal companies became the bosses of the new British coal and nothing really changed for the workers. To say these issue were "totally ignored" is inaccurate. I agree perhaps more should have been said but as the reviewer himself aknowledges, the broad brush approach inevitably entails some over simplification. As I have previously said, this was not meant to be an in depth study of the Labour Party's failings or the failings of the nationalised industries. If it was, it would not be on film 4 or have been played in cinemas across the country. "As an extremely blunt instrument for rousing the rabble from the slumber of 'there is no alternative', The Spirit of '45 may serve some valid purpose for those with little knowledge of history or experience of activism." This is the sort of comment I would expect to read in the Daily Mail. Forgive if I have missed some sarcasm or attempt at humour. The 'rabble' are marginilised to such an extent and excluded from almost all sections of the media (unless it is a programme about 'feral youths' or the 'underclass' or 'chavs' etc) that a film such as this should be celebrated. As a worker myself, I was inspired by the generation of working class people who built institutions in this country such as the NHS, council housing etc even though I know full well it wasnt perfect. Obviously the film should not be immune from criticism but the tone of a review like this completely misses the point of the film. It is not meant to be an in depth study of what went wrong, dealing with issues of theory, bearucracy, vanguardism or whatever. Because the reveiewer disagrees with the politics of Ken Loach or of the post war period is no reason to tear the film to shreds. Enjoy it for what it is, a simple film that is a valiant attempt to change the narrative of our society at the moment. The whole, shirkers, scroungers, benefit cheats, feckless onslaught that working people and the unemployed have been subject to. It is an attempt to give working people a bit of pride in their own acheivments and that of their class. If it inspires a number of people to become more aware of class issues today, then it will have been a worthwhile endeavour. Firstly, you think it is 'cutting' to point out that the entire film uses very old-fashioned documentary methods. This was merely a statement of fact - I personally don't mind those methods in themselves, but there may be an issue about who the film will therefore apppeal to. Similarly, the choice to be 'backward-looking' may be OK in representing how the interviewees felt at the time - but makes the importance of avoiding any mistakes made even more urgent if we're thinking about what to do now. Did they have no worthwhile opinions on all that? Why weren't we told? Secondly, it is not 'dismissive' to point out that putting contemporary interviews also in black and white risks reducing their impact to the same nostalgic distance as the archive footage. Many people today may be more, not less, likely to conclude that the film and its subject has no relevance to them. Worse, to then conclude that I somewhow don't 'care' about the suffering of the 20s and 30s is insulting - unlike you, I don't have to 'imagine' or 'read about' it, because I learnt about it first-hand from family and others. If you think it simply doesn't matter how such emotive material is presented, that's your problem (but you're the one being condescending and dismissive, and also basically clueless about the innate intelligence of working-class people if you think the only alternative to giving no analysis is a 'theoretical diatribe'). Finally, I am a proud lifelong member of what I euphemistically called the 'rabble', but sadly I don't believe many fellow members will be 'roused' by this film. Like many of us, me and mine know full well from bitter personal experience that the NHS, council housing, nationalised industry, etc, weren't perfect. But you wouldn't really get much about that from this film, or the reasons why - and if we want to learn from history rather than repeat it, that is unforgivable.The Spirit of '45 is absolutely not trying to 'change the narrative' of this society, it is merely recycling some superficial elements of a previous one and not even doing it very well. I'm sorry that you think daring to suggest all this in a very short film review is like something you'd expect to read in the 'Daily Mail'. But, I'm afraid, your notion that making a few obvious criticisms means 'tearing it to shreds' is much more akin to 'tabloid thinking' and pretty bloody daft too. Having said all that, you think the film "is an attempt to give working people a bit of pride in their own acheivments and that of their class. If it inspires a number of people to become more aware of class issues today, then it will have been a worthwhile endeavour". Apart from asking: which 'working people'? and which of 'their own achievements'?, if these two things were true, I would probably agree with you. But I would still feel obliged to try and describe it accurately, and mention its flaws and shortcomings as carefully as possible within constraints of space. If you prefer vapid patronising puff-pieces because you want to believe someone's heart's in the right place, that's your choice. Really enjoyed your review Tom and your phrase "conveniently ignored or blithely glossed over" really sums up so much of Left wing history. I'm going to nick it. Anything that was achieved in 1945 can hardly be regarded as an achievement for the working class. The 2nd World War arose on the massive defeat of the first revolutionary wave: it has been called "Midnight in the Century" such was its awful horror. The defeated working class was its fodder. That the triumphant British bourgeoisie - didn't they "win" the war, or was that really the triumphant American bourgeoisie? - felt it necessary to "give" something back to the working class in 1945, or possibly to buy off trouble? shouldn't be seen as some wonderful gain for workers but rather as a tranquilizer. After all, how many dead and wounded working class soldiers were there internationally; how many civilians killed and injured in bombing raids in London, Dreden and Hiroshima, to name but three; and how many people world wide were forced to live with the scars of that terrible time the rest of their lives? I don't think the film can give any "pride" to the working class. The best it might do is wake us up. Firstly, I didnt say your review was 'cutting' because it you said it used old fasioned documentary methods. I said the whole tone of your review was cutting. Secondly, agreed, you did not say "totally ignored". Genuine mistake so apologies for that. As keen as I am to avoid accusations of trolling (Im not sure if that sentance is an accussation itself? ), you did say the issues were "conveniantly ignored" when as I mentioned with the criticisms of the new British Coal, this was not entirely accurate. Apologies for falsely quoting you. Thirdly I never said you didnt 'care' about poverty in the 20s and 30s. I said I felt you were dismissive (and re reading your review, I think I misunderstood you when you wrote "adopting the same monochrome palette"). You quoted me as saying you didnt 'care'. If you are going to reproach me (and fair play, you were right to) for falsely quoting you, you should take the care not to falsely quote me. "Worse, to then conclude that I somewhow don't 'care' about the suffering of the 20s and 30s is insulting - unlike you, I don't have to 'imagine' or 'read about' it, because I learnt about it first-hand from family and others." Please dont make assumptions about my background or experiences with poverty. I didnt to you. I said "poverty most of us can only imagine or read about". The "unlike you" jibe is a petty dig. "I'm sorry that you think daring to suggest all this in a very short film review is like something you'd expect to read in the 'Daily Mail'." I suggested no such thing. I said your use of the phrase "As an extremely blunt instrument for rousing the rabble from the slumber of 'there is no alternative" read like somethiing from the Daily Mail. I then apologised in advance if I had missed the sarcasm or attempt at humour. I did not suggest your reveiw read like something from the Daily Mail. While disagreeing with it, I thought it was very well written. "doing something other than blithely glossing over them would not entail an 'in depth study'"
Maybe I put it badly but what I was attempting to say was that in my opinion, you seem to be criticising the film for not being something it was never trying to be. We'll have to agree to disagree on the film. I certainly dont "prefer vapid patronising puff-pieces" but I do feel that the film is a worthy endevour especially now when the working class are portrayed in such a poisonous light by most of the mainstream media. As a child whose family benefited from the free tins of dried milk, the bottles of orange juice and cod-liver oil; the maternity and child welfare services; the medical treatment for all, from spectacles and false teeth; free hospitals where care for the first time was available for the injured and seriously ill; I think it a bit rich when these are presented as merely a sop to the working class. They were a product of class struggle and the rich sods who were forced to concede these gains have been trying to claw them back ever since. Agree with you there, I think working class people can be rightly proud of many things acheived in the period after the war. Nothing was given to us, it was won by struggle and organisation. We shouldn't belittle past 'reforms' that were of practical benefit to us now under attack, but these were at best a compromise between working class needs and capitalist needs borne out of the class struggle of an earlier period and part of a process of integrating working classstruggle into a means of modernising and strengthening the system rather than defeating it. "Whilst Labour and their apologists may ‘wax lyrical’ about the 1945 government, about Clem Atlee, the NHS, the welfare state, the house building programme – and then question why the Conservatives cannot achieve the same in similar economic circumstances – they do not mention how in 1945 the UK had access to several cash cows, ripe for milking. They claim to have built modern Britain despite being bankrupt, yet they never mention how between 1945 and 1951 they raped and pillaged the colonies at a level never seen before at any time in history. In the years of that first Atlee government over 60% of all exports from the UK to the US were commodities such as rubber and tin, stolen from the colonies. There is no mention in the film of how the UK was able to hugely augment its GDP in the post-war period, by subjecting the working class of the colonies to horrific oppression, and stealing of their produce. There is no mention in the film, of the Atlee sanctioned concentration camps in Malaya, used to house disruptive trade unionists that had the audacity to complain about the UK stealing all of the rubber they produced, which was then sold at a 1500% mark up in the international market? Is there any mention of how Atlee’s government sanctioned the massacre of striking workers on a plantation in Malaya, so that the flow of money into the UK did not slow down? Good point. I had not really considered post war imperialism and its relationship to the post war reconstruction in any great detail. Food for thought definitely. I should make it plain that I have not seen ‘The Spirit of ‘45’ so can only comment on other people’s observations. My understanding of the way the ruling class run capitalism is that they do their best to maximize their own interests and screw the folk who can offer least resistance - witness the current austerity measures. To infer that the horrendous exploitation of the native people of the British Empire was giving ‘the British working class a helping hand’ is disingenuous – roughly equivalent to claiming the so-called ‘bedroom tax’ is a subsidy for people using the NHS. The working class may make choices that are blinkered and not in their own interests, but they should not be blamed for the crimes of the ruling class. I thought the documentary provided a good overview of the political landscape in post-war Britain. It was by no means a detailed account but I think Loach's intention was to educate and inspire peope, particularly those of the younger generation, to question this government's insistence on austerity by showing the positive effect of public industry. Admittedly, the industries owned by the government were run from the top down with workers' having little or no say but this system was preferential to the system imposed by later government's, that of private ownership.